Convert documents to JATS XML. Cloud or On-premise. Interested in seeing it in action? Upload your document and sign-up for a demo. 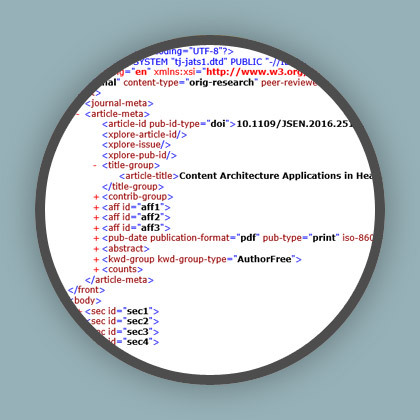 See how the Intelligent Content Server tags well-formed Word documents with JATS. 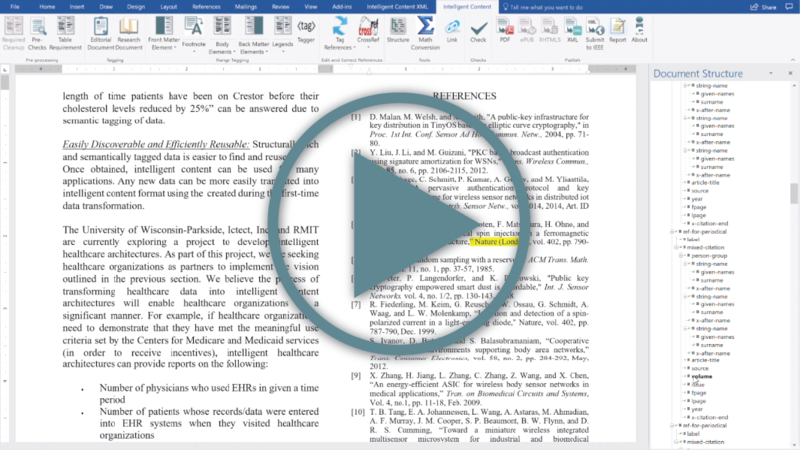 Watch how the Intelligent Content Server tags a Word document and highlights issues, and how the Word document can be easily edited and retagged within Microsoft Word. Can you give me an overview of this? Ictect – the intelligent content company – is pleased to offer this cloud-based service for automation of JATS XML for journal documents. You simply upload Microsoft Word documents and our software (Intelligent Content Server) tags them. 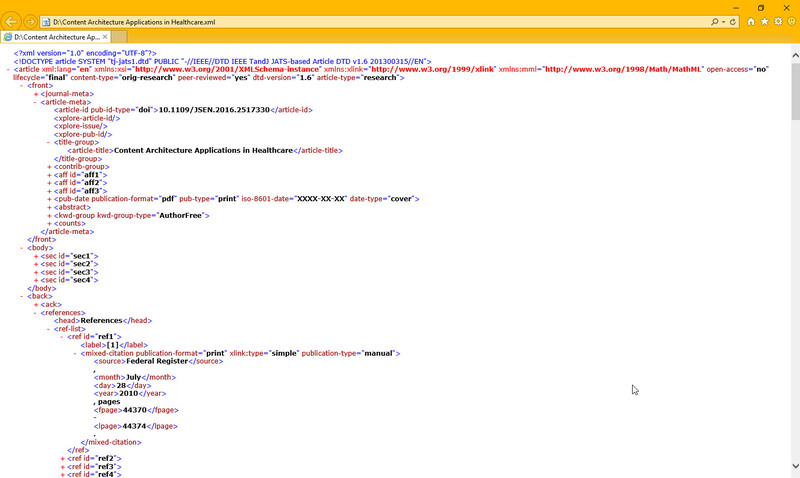 You receive a tagged Word document, and a JATS XML document. We are also offering this as an on-premise service that you can run on your own. What is a tagged Word document? 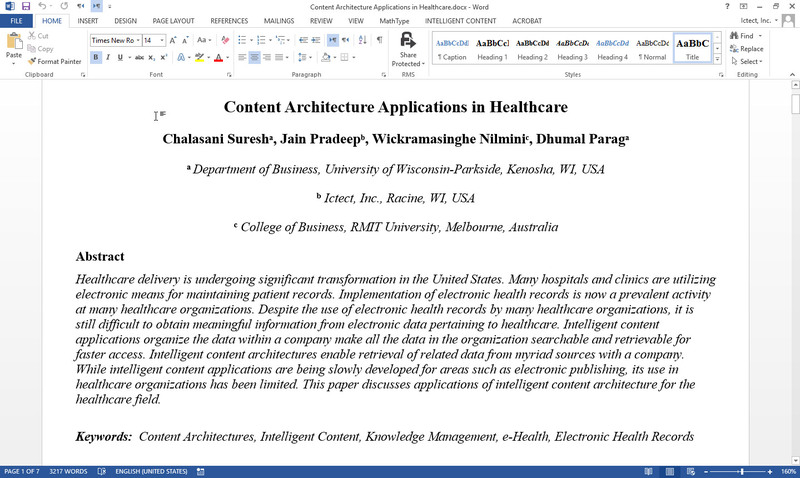 With Ictect’s patented technology, Microsoft Word is enhanced to maintain tags (or XML structure) in the document. You can open a tagged Word document in Microsoft Word or in Office 365 as an ordinary document. 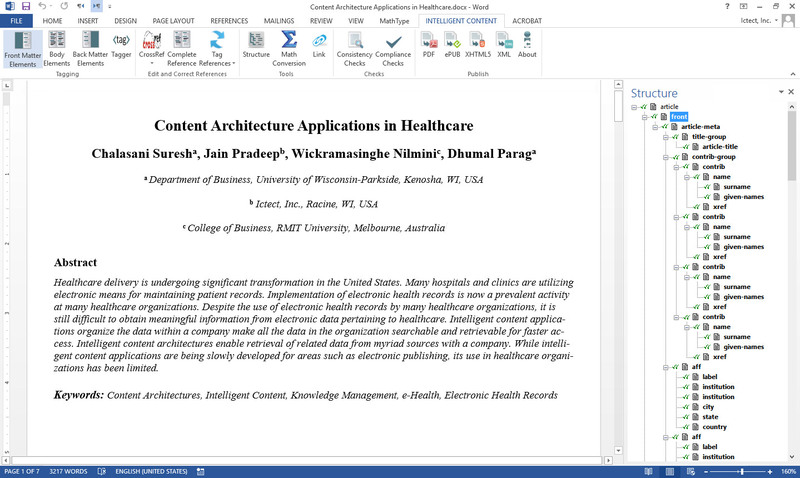 With Ictect’s plug-in Intelligent Content Tools (icTools), you can view and edit document structure in Word. We are offering this service to publishers, service providers and solution developers. There is a setup fee, determined based on the complexity of your documents and your customizations of JATS. Then, there is per-document fee for conversion. For larger volumes (100,000 pages or more), the setup fee is waived. For on-premise installations, there is one-time licensing fee for software. In addition, there is fee for software configuration, and an annual maintenance fee. We are currently working with some journal publishers in the US. We are happy to make introductions after a mutual non-disclosure agreement (NDA) is signed. Tagging journal documents has been a manual process for many years. How does this automate it? Ictect’s patented software (US patent #7,251,777) has the unique “schema-driven auto-tagging” capability. 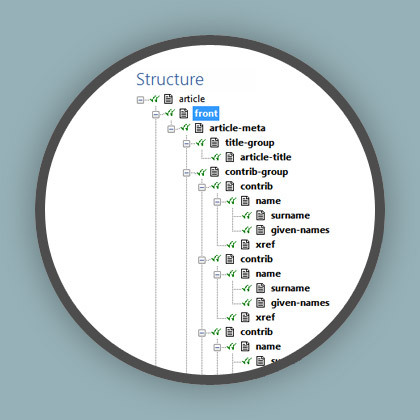 It handles formatting and content variations in the documents, and tags documents to the granular level (for example, deep tagging in front matter or references). It also highlights any issues encountered in the documents (typically, content that does not conform to the spirit of the style guide). That makes correcting non-conforming documents easy in Microsoft Word. We work closely with our customers. We update software configuration for specific customers for frequently encountered issues in the documents. This improves the degree of automation. The more you use the software, the higher the degree of automation. For a full discussion of this, we suggest you sign up for a demonstration with your sample documents. What types of documents does it handle? 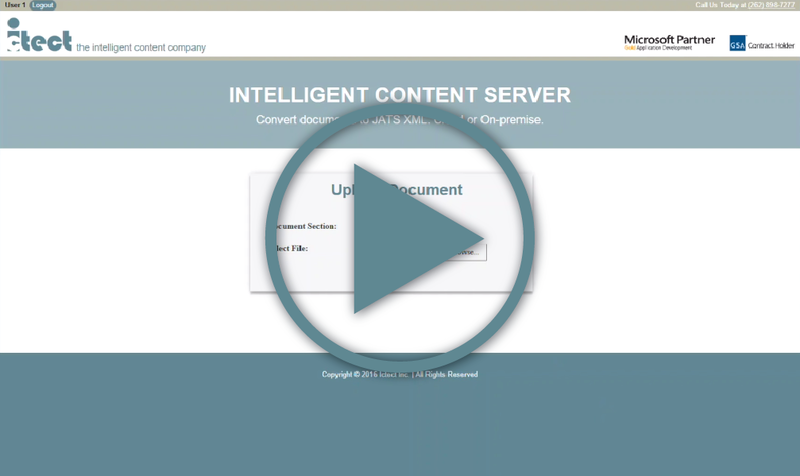 Intelligent Content Server handles raw manuscripts as well as copyedited/styled documents. Do you require specific styles to be applied to the manuscripts? No. We can tag documents without applying any specific styles (without any document preparation). Of course, it is easier to automate the tagging when your documents have standardized styles. Can you handle customizations to JATS? Yes, as part of setup, we configure the software to deliver you JATS with your customizations. The complexity of your documents (how consistent they are, how conforming they are to the style guide, etc.). Depending upon these, the setup time may be days to weeks. Once the software is configured, tagging a document takes less than a minute! Where does it fit in a journal publishing workflow? As soon as the manuscripts are approved for publishing, they can be automatically tagged. This will save cost as you will not need to send the manuscripts to a vendor for tagging. This will also improve the turn-around time as the tagging is instant. You can include Intelligent Content Server for tagging after the documents are copyedited. How do I convert documents that have complex issues? Intelligent Content Server will highlight issues encountered in the documents in the tagged Word document. You can make corrections and re-submit the document. Or, you can use Ictect’s Microsoft Word plug-in icTools for editing content and structure. Is this for legacy document conversion or for ongoing publications? This service is for both types of documents. Can you convert PDF documents as well? 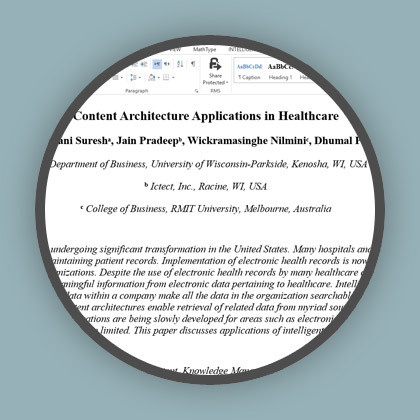 You can use a good PDF to Word converter before submitting documents. Some clean-up will be necessary. If you would like, Ictect can provide a quote to do this. Yes, we invite solution developers to embed this in their solutions. This is a cloud-based system, and can be integrated in your cloud-based offering. Currently, our system is based on Microsoft Azure cloud.